The branch of Suzu Kin I went to was located at Edsa, Corner PDEA-NIA road. It's on the Northbound side of Edsa. If you're coming from Makati, go up the Monumento Flyover. When you go back down Edsa, drive a bit more until you see a Shell Gas Station up ahead. 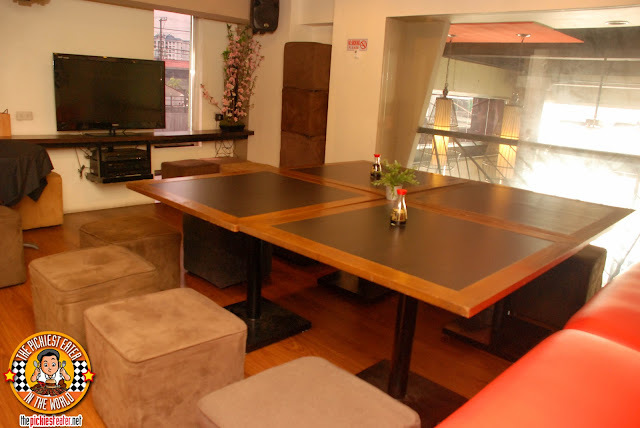 Though the location in Edsa is just waiting to be discovered, this is far from a "Hole-In-The-Wall-slash-Dining-Room-In-Someone-House" restaurant. Suzu Kin's Edsa Location is a legitimate Japanese restaurant with a nice mix of modern interiors with a Zen like wooden feel. The Second floor offers a mini conference room that can sit around 10 to 12 people, and is a popular place for a night of Karaoke (I called dibs on "My Way"!!). I'm a fried rice guy, through and through. If It didn't cost too much on the calories, I would have it with every meal. 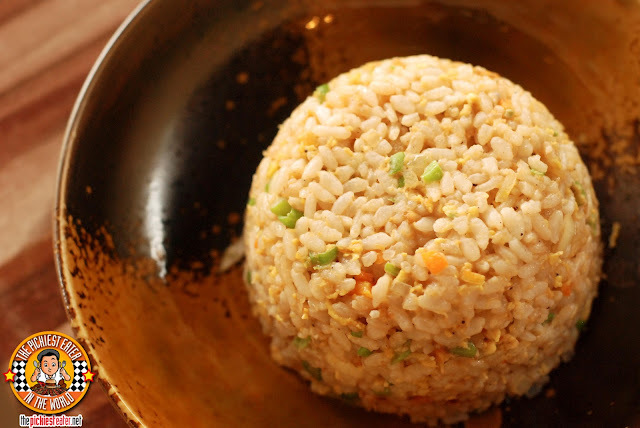 As soon as I tried the Yakimeshi Rice (P68), of Suzu Kin, I knew this would be the start of a beautiful friendship. First off, for the price, it was pretty reasonable. 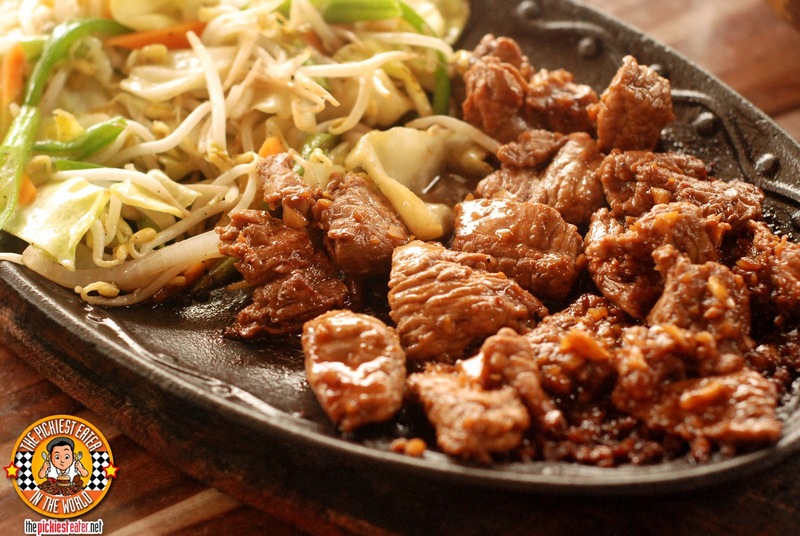 It had a great balance of seasonings, without going overboard and overwhelming your taste buds. Truly the ideal partner for your Japanese Meal. 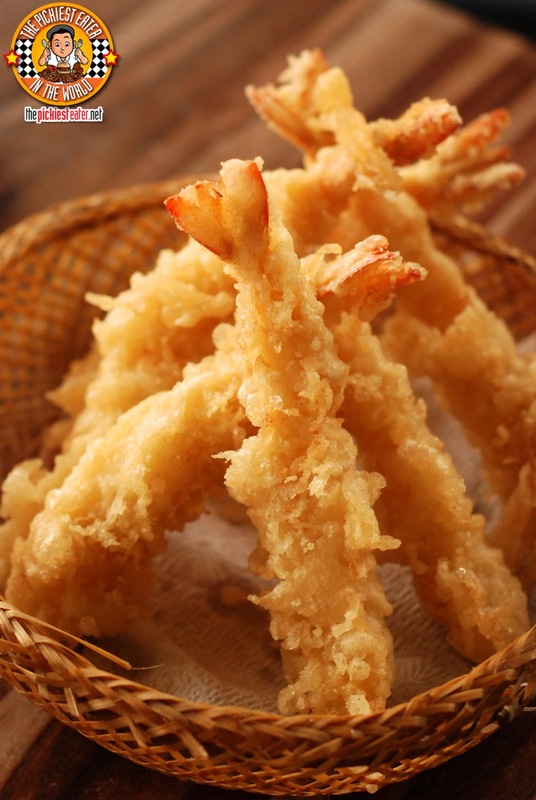 When you ask me what shrimp dishes I eat, the first dish that will pop into my mind is Tempura. 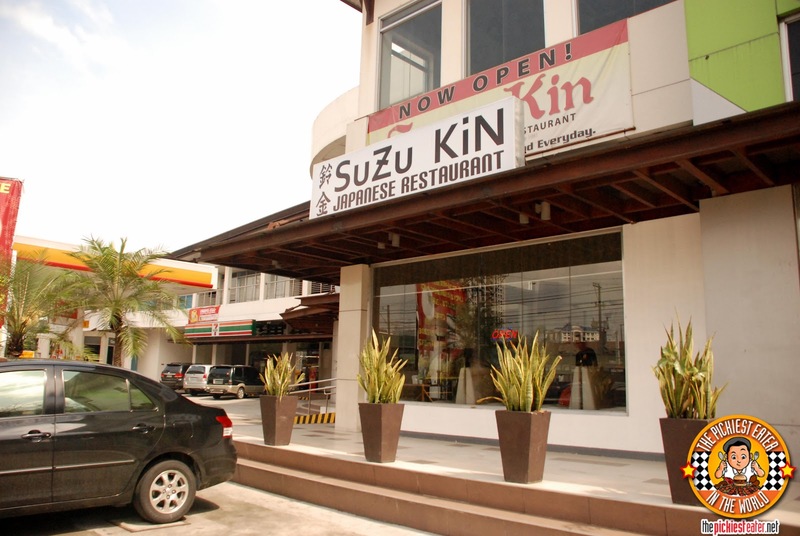 And I was pleasantly surprised to find that Suzu Kin, offers one of the best Ebi Tempura (P200) I've ever tasted. I think it's the breadcrumbs or something.. It has a certain creaminess to it that makes one bite -nay- one PRAWN an impossibility. When you eat it with the Yakimeshi Rice? It's OVER. 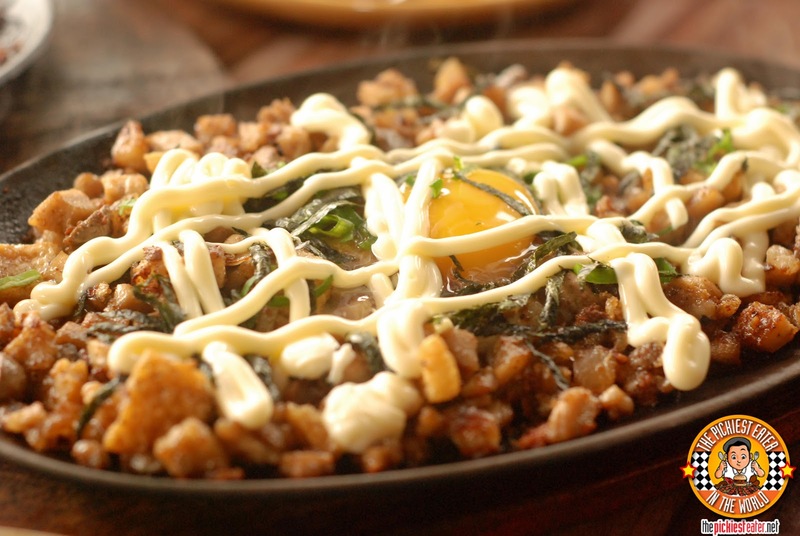 Something that I was eager to try, that I saw from Suzu Kin's Facebook account, was the Japanese Sisig. This had the classic recipe of Sisig - Crispy minced pork and chicharon bits, mixed in with a little bit of pork liver, and a raw egg cracked into the center, allowing it to cook as the meat sizzles. However Suzu Kin added a little Japanese ingenuity by drizzling it with healthy streaks of Japanese Mayo, and garnishing the top with thin strips of Nori. Whenever I'm at a Japanese Restaurant, I am always drawn to the Tenderloin Beef Teppanyaki (P198). Suzu Kin had a nice version, with the beef, perhaps not as pillow soft as other Japanese places I've tried, but the flavor still spot on, nonetheless. A delicious mix of garlic and soy enhanced the natural flavor of the sizzling beef, which again, matched perfectly with the Yakimeshi Rice. Rina and Rain absolutely adored the Sukiyaki (P205). 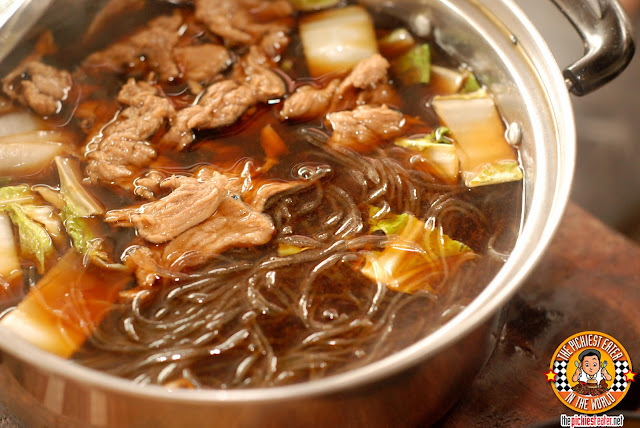 Thin slices of tender beef bathed in a sweet broth, swirling in medley of glass noodles, mixed vegetables and Tofu. I would have liked it to be a bit sweeter, but Rina, being the Bruno Mars fan she is, thought it was amazing just the way it was. 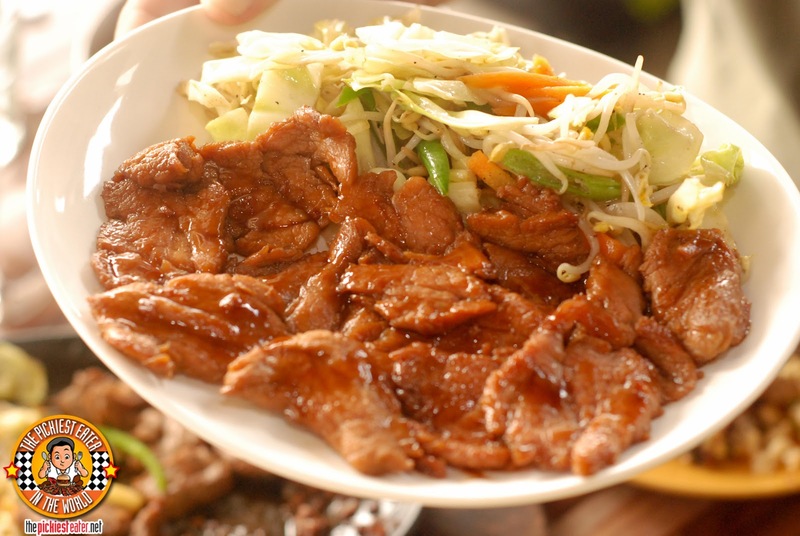 Something I really wanted to try was the Pork Shoga Yaki (P189), because I wanted to compare it to the my favorite dish at Nihon Bashi Tei, the "Pork Ginger". I realized that comparing the two dishes was rather unfair, especially since Suzu Kin uses Pork loin, while Nihon Bashi Tei seems to use a thinly sliced pork belly cut.. in other words, Bacon. So you can imagine which one I prefer. 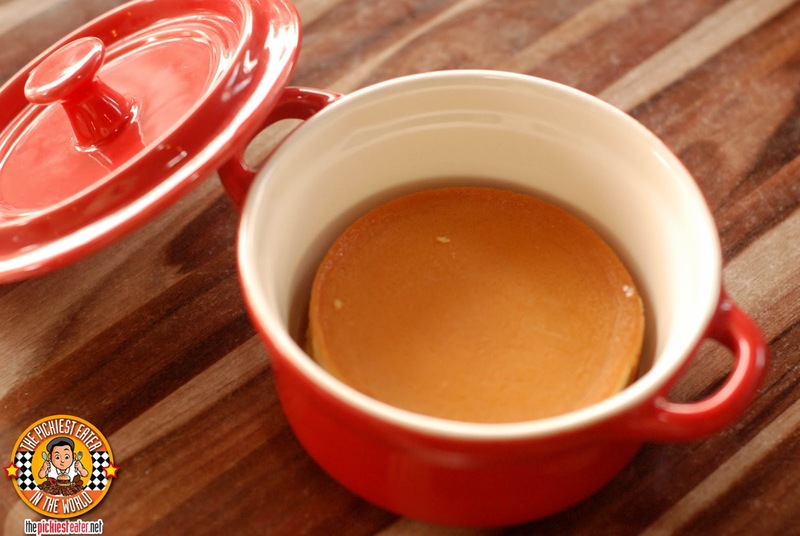 Though it isn't a very "Japanesey" way to end the meal, I do suggest you try Suzu Kin's Leche Flan. It was nice and creamy, not too sweet with no bubbles in it, and they added a nice twist: They served it Semi-Frozen, so it was virtually like eating a Leche Flan Ice cream! Thank you to Cherry and Leslie for their gracious hospitality! We really enjoyed our trip to Suzu Kin EDSA and you can expect us back soon! Rain was in a really good mood after eating so much sukiyaki! She was playing her kissing game with her mommy! 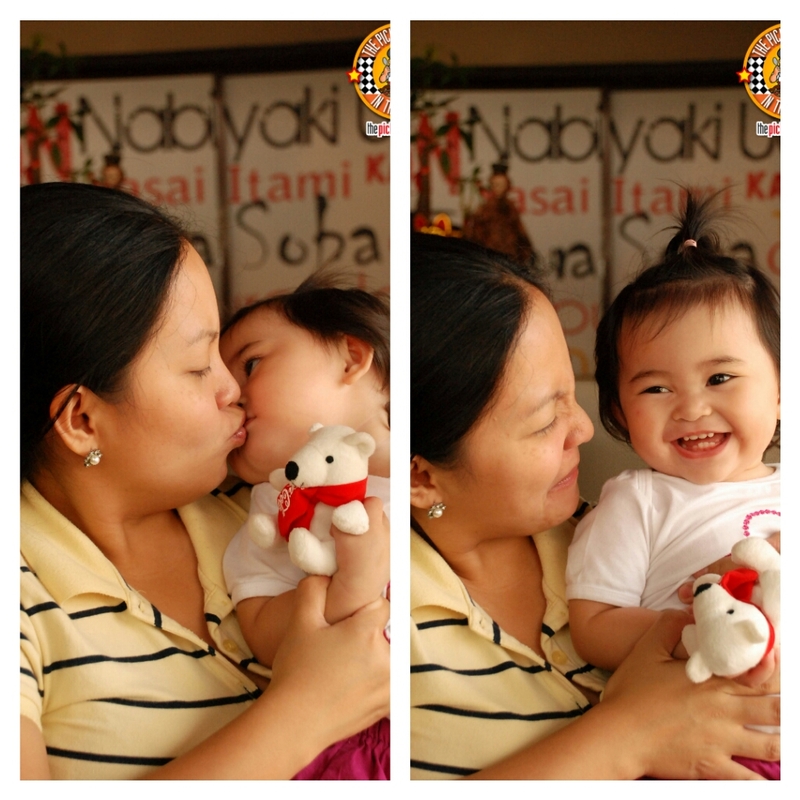 Rain gives her mommy a kiss, then mommy pretends Rain has bad breath, and goes "pwe!"... Rain can't help but crack up! hehe. It's a good thing you ate at a franchise branch where the quality of the food is still maintained. 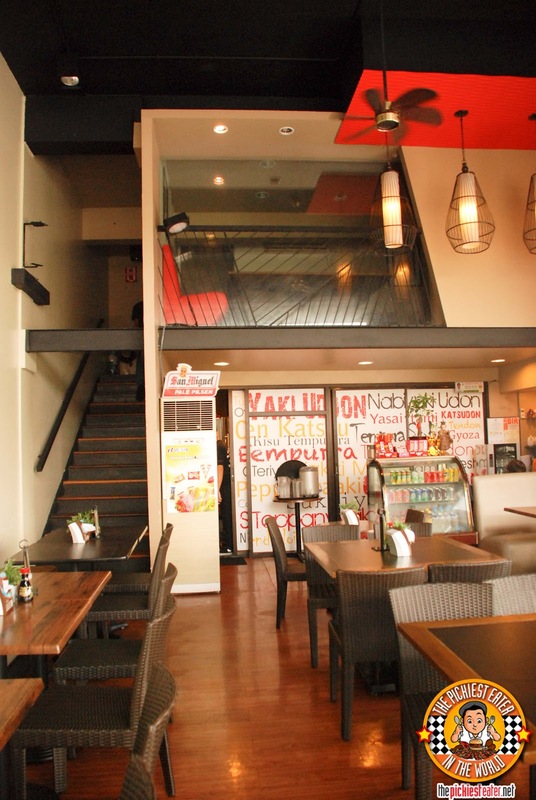 My partner lives quite near the original Suzu Kin along Kamagong and we used to eat there quite often until we felt that the quality was seriously deteriorating: food was oily, the tempura wasn't crispy and tasted greasy, etc. Haven't been there for a few years, but I heard that if you want the taste of the suzu kin of years past, then you should go to the franchise branches and skip the original kamagong branch. Thanks Inaki! She's growing up too fast :( Others say that's a good thing but whatever.. 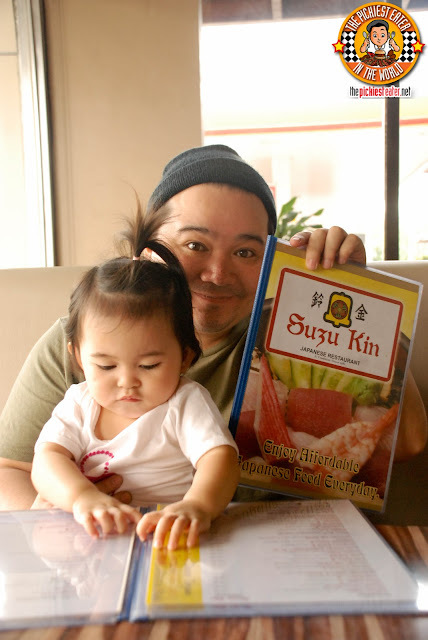 I still want her to be my little baby girl.. sniff..
Glad to hear the feedback from you regarding the orig branch.. I hope they managed to right their course.. it would be a shame for their legacy to be tarnished.. by the original branch at that! 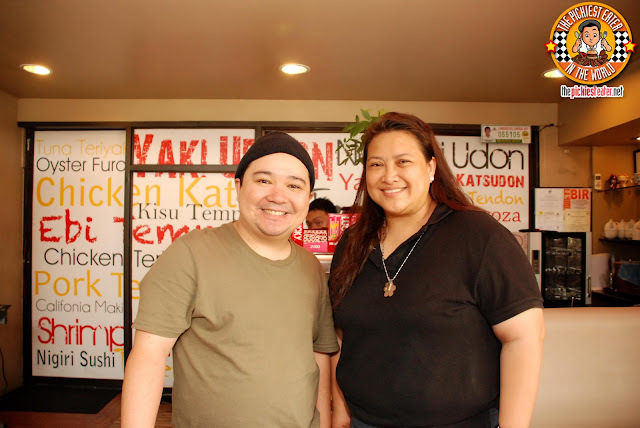 I've always seen Suzu Kin along EDSA since we refuel and take bathroom breaks in the big Shell Station beside it! :D Haha.. Too bad though I haven't tried it out yet. Must. Visit. Soon. Especially since it's just a thirty-minute drive away from my place. You should try it Sumi! Go in your anime costume pa para in character hehe..
Hope you can see Baby Rain again soon!